It was neither the short circuits in his brain nor the bubbly in his tummy-tum that made Champagne Charley lurch and reel at an Orville Corporation Labour Day picnic. The tumult was of an unexpected temporal nature. Explosions rocked the small intestine as a time machine materialised in his tumescent gullet. 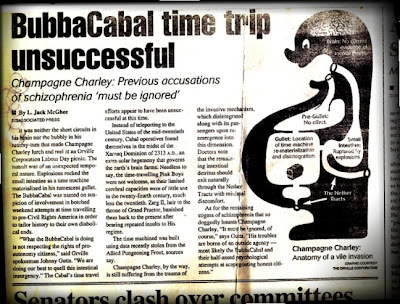 The BubbaCabal was named on suspicion of involvement in botched weekend attempts at time travelling to pre-Civil Rights America in order to tailor history to their own diabolical ends. “What the BubbaCabal is doing is not respecting the rights of pro-autonomy citizens,” said Orville spokesman Johnny Gutts. The Cabal's time travel efforts appear to have been unsuccessful at this time. Instead of teleporting to the United States of the mid-twentieth century, Cabal operatives found themselves in the midst of the Xarnaq Dominion of 2313 A.D., an extra-solar hegemony that governs the earth's brain farms. Needless to say, the time-travelling Pink Boys were not welcome, as their limited cerebral capacities were of little use in the twenty-fourth century, much less the twentieth. Xarg VI, heir to the throne of Grand Praetor, banished them back to the present after bearing repeated insults to His regime. The time machine was built using data recently stolen from the Allied Pungeoning Front, sources say. Champagne Charley, by the way, is still suffering from the trauma of the invasive mechanism, which disintegrated along with its passengers upon re-emergence into this dimension. Doctors note that the remaining intestinal detritus should exit naturally through the Nether Tracts with minimal discomfort. As for the remaining stigma of schizophrenia that so doggedly haunts Champagne Charley, “It must be ignored, of course,” says Gutts. L. Jack McGhee is a staff writer at the Heritageville Observer.